I've written about WebSockets in ASP.NET Core several times before (touching subjects like subprotocol negotiation, Cross-Site WebSocket Hijacking and per-message compression), but I've never written a post about the fundamentals of managing WebSocket lifetime. In this post I intend to fix that. The documentation does a pretty good job explaining the key aspects and showing the most basic scenario. Unfortunately real-life scenarios are usually not that simple. In most cases we want to have access to the WebSocket outside of middleware responsible for accepting the requests. This leads to handing the WebSocket off to a dedicated service/manager. While doing this, a couple of rules needs to be followed to ensure to correct lifetime handling. The most important thing to remember when writing a middleware for accepting WebSocket requests is that the middleware should not terminate before WebSocket is closed. Allowing the middleware to terminate results in request thread being completed and underlying connection closed. It's often also worth to design the middleware to be the last in the pipeline. This comes from the fact that middleware is bind to a specific ws:// or wss:// URI, so unless the goal is to handle different protocols under same URI anything else than WebSocket request is an error. 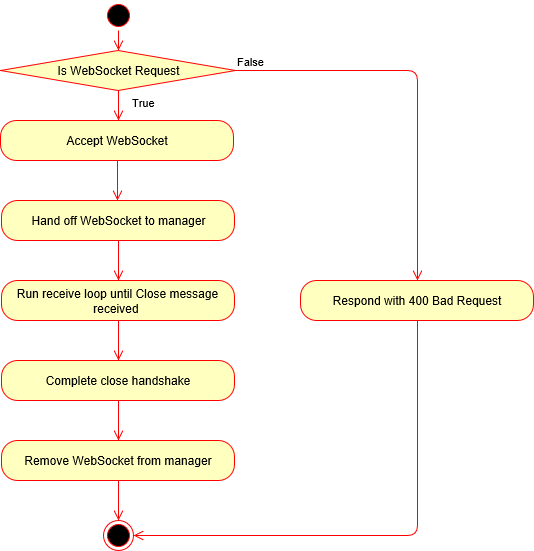 The general flow of middleware which accepts WebSocket request and then hands it off is shown on below diagram. There is a number of ways to implement this flow, so next section should be considered my opinionated approach (here you can read about different one which leverages inheritance). I will first show the code of the middleware and then discuss its details. The code can be easily mapped to the diagram, the important parts are IWebSocketConnectionsService and WebSocketConnection. There is nothing very specific about IWebSocketConnectionsService implementation. It's supposed to store the connections (in case of my demo project it uses ConcurrentDictionary for that purposes) and expose high level operations which are needed by other parts of application. The WebSocketConnection, which servers as WebSocket abstraction, is worth taking a closer look at. It's public API needs to bridge two words. It must allow for sending and receiving messages to be usable by other parts of applications. It also needs to provide the receiving loop for the middleware to wait on, together with information required to complete the close handshake. I will skip details of SendAsync methods (typically they check the WebSocket status and call SendAsync on it). What I will focus on is the receiving loop hiding under ReceiveMessagesUntilCloseAsync. It has two tasks. First is to wait for Close message and when it arrives return control back to the waiting middleware (the middleware will need CloseStatus and CloseStatusDescription from that message to complete the handshake). Second task is triggering ReceiveText or ReceiveBinary event when either Text or Binary message arrives. There is one unexpected situation which should always be expected - client closing connection prematurely. Most of the time this means that client has crashed (the easiest way to simulate this is killing the browser process when it's connected to the application). The connection being closed prematurely manifests itself through WebSocketException (with WebSocketError.ConnectionClosedPrematurely as WebSocketErrorCode value) thrown from the receiving loop. The WebSocketConnection should handle this exception nicely so the middleware can remove the connection from manager and terminate. A small change to the middleware is needed as in this case the close handshake shouldn't be completed (it hasn't been started). This way the prematurely closed connections will be handled correctly. The demo project available on GitHub contains a modified version of this code as it also shows all the features described in my previous posts.